History and modern art meet at the Buffalo Bill Center of the West this August 16, 17, and 18. Step back to the time of the blacksmith with four professional blacksmiths who forge a horse sculpture using only tools of old-time settlers: iron, fire, hammers, and anvils. Watch as the smiths heat iron to a glowing orange and shape it on the anvil with hammers of different shapes and sizes. As the iron bends and twists, the blacksmiths chisel it into pieces and reattach them with rivets and collars, all without modern electric tools! 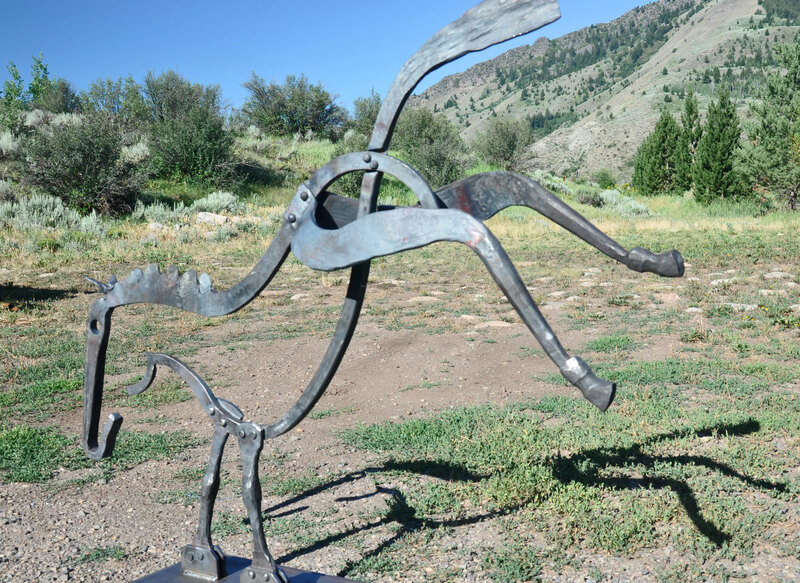 Over the three days at the Buffalo Bill Center of the West, these artists-in-iron reheat the 4 by 4 foot horse sculpture over and over until it satisfies their artistic vision. The blacksmith trade dates to before the discovery of the Americas by Europeans and remained critical well into the 1900s when machinery began to replace much of the blacksmiths’ work. Even Lewis and Clark brought their own blacksmiths along their famous expedition to take care of horses and to shoe them. On the Lewis and Clark Expedition, blacksmiths also made tools, repaired ships and carriages, and forged tomahawks for Indians in exchange for food. Blacksmithing went through various stages of development but is now most popular and common with sculpture and art. This weekend demonstration at the Center of the West reveals that age-old techniques of blacksmithing can be used to create contemporary art. This three-day public demonstration is sponsored by the Northern Rockies Blacksmiths Association (NRBA), a non-profit organization that preserves the old art of blacksmithing. They support blacksmith education for new blacksmiths, continue professional development of working smiths, and raise public awareness for this old trade by setting up demonstrations. The demonstration in Cody, Wyoming hosts blacksmisths Steve Fontanini from Jackson, Wyoming; Frank Annighofer and Annette Lavalette from Roscoe, Montana; and Duane Bomar from Sheridan, Wyoming. 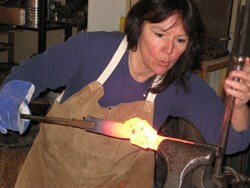 All four have many years of experience in forging metals from steel, copper, and bronze. They all create metal art and sculptures that can be found in private homes and galleries across the country. They also produce architectural forged iron like railings, gates, fire place accessories, light fixtures, and furniture. For more information about the Buffalo Bill Center of the West and its public programs, visit http://www.centerofthewest.org. Since 1917, the Buffalo Bill Center of the West has been committed to the greatness and growth of the American West, keeping western experiences alive. The Center, an affiliate of the Smithsonian Institution, weaves the varied threads of the western experience—history and myth, art and Native culture, firearms, and the nature and science of Yellowstone—into the rich panorama that is the American West. The Center of the West has been honored with numerous awards, including the prestigious 2012 National Tour Association’s Award for “favorite museum for groups” and, most recently, the 2013 TripAdvisor Certificate of Excellence. The Center is open daily 8 a.m. – 6 p.m. For additional information, visit the Center's Web site or its page on Facebook. Links, info, & contacts An Iron SculptureThis sculpture was created by the group demonstrating at the Center.